Durham Jets were brought back down to earth by a crushing NatWest T20 Blast defeat at Edgbaston last night. After two successive wins in the shortest format, Durham were no match for an inspired Birmingham Bears side, who romped home by nine wickets, with Varun Chopra the star of the show. Jets posted a below-par 154-9 before the home side eased to victory with 14 balls to spare. Durham coach Jon Lewis – who will hope for better form away to Leicestershire today – admitted: “We definitely came up short with the bat on a good pitch. “We needed to be nearer 180 to be competitive and that has probably something to do with us never going more than three overs without losing a wicket. “If you don’t get partnerships, even in the short form of the game, you are going to struggle. 29 for three is not a place you are going to win too many games from. “They played it very well with the bat, but it was almost impossible for us to put any pressure on them. “Ian Bell didn’t play an attacking shot for the first six overs. He was able to play himself in nice and calmly. Varun played a few shots and played them nicely but they were able to bat without a great deal of pressure. Chopra returned to the Bears’ team in the most spectacular style with a brilliant unbeaten 97. Selected for his first Blast game of the season after Sammie Hain was laid low by food-poisoning, Chopra blasted eight fours and five sixes in a destructive 58-ball knock to thunder his team past a modest targete. 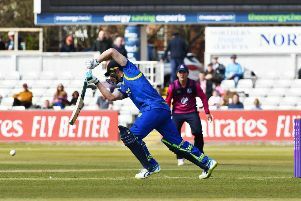 Durham, who failed to build on Wednesday’s 66-run win over Notts Outlaws, found it hard going against an attack strengthened by the return of Chris Woakes and Rikki Clarke, who finished with a combined 8-1-50-5. At 118-8 with three overs left, the Jets were in disarray before some late hitting from Paul Collingwood (40 balls, two fours, two sixes) at least lifted them to respectability. That’s all it was. An opening stand of 94 in 10 overs by Chopra and Bell settled the game and Chopra saw the job through, narrowly failing to become only the second Birmingham player to score a NatWestT20Blast ton. After Durham were put in, Clarke soon made his presence felt with a wicket-maiden in his second over, Graham Clark falling to a brilliant catch by Josh Poysden at mid-on. Olly Hannon-Dalby had already removed Mark Stoneman, who edged behind, and then held a sharp catch at short fine-leg off Clarke to oust Michael Richardson. Phil Mustard’s typically busy 22 (20 balls) ended when he lifted Woakes to Poysden at fine leg. Ryan Pringle (33, 18 balls) cleared the ropes twice but was bowled by spinner Ateeq Javid’s second ball and when Woakes returned to remove Paul Coughlin and Scott Borthwick in three balls, the Jets badly needed some late impetus. Collingwood provided it with two sixes in the last over from Hannon-Dalby. Chopra cancelled those out in no time, lifting Usman Arshad over the extra-cover fence twice in the bowler’s first eight balls. Chopra and Bell had 50 on the board in 34 balls and the former continued to give spectators excitement and alarm in equal measure as he sent two more big hits into the crowd on his way to a scintillating 30-ball half-century. Bell (35, 27 balls) was bowled by Scott Borthwick and thereafter it was just a question of whether the target was tall enough for Chopra to reach his ton. It wasn’t, quite, but the former Essex opener had still given the crowd an innings to savour. Warwickshire director of cricket Dougie Brown said of the Bears’ triumph: “It was a very professional performance. We were very disciplined with the ball with Rikki Clarke and Olly Hannon-Dalby starting us off well, Chris Woakes bowling out the powerplay and the spinners squeezing in the middle. “They had great support in the field and we took wickets all the way through which is something we talk about doing, playing an aggressive brand of cricket. “Varun Chopra played superbly and deserved a hundred. It was a pretty special innings and he batted like a century-maker in every way. It was a top partnership between him and Ian Bell up front. “It makes a huge difference when you can bring someone like Chris Woakes back into the side. We had to make a difficult call and leave out a couple of guys who have been outstanding for us. Belly and I have got some tough calls to make selection-wise. Nobody likes getting a tap on the shoulder to say ‘sorry you’re not playing’ but when you have got a lot of guys in contention someone has to miss out.